Question: Right after the accident I didn't think I was injured, but now I am very sore, what should I do? Injuries from accidents occur in many different settings. Sometimes the injuries arise from an automobile or motorcycle accident, other times they may occur as the result of a dangerous condition on another person's property or perhaps from the use of a product which malfunctions or is improperly designed. In the worst of circumstances, injuries can result in the wrongful death of a person leaving behind surviving family members to deal with the emotional and financial losses caused by the wrongful death. If you would like to schedule a initial consultation contact an Kansas car / boat / semi accident attorney, representing clients in Olathe at McCullough, Wareheim & LaBunker, P.A. Give us a call at (785) 233-2362 or complete our inquiry form. Get in to see your doctor immediately and advise that at first you thought you weren't hurt, that you were wrong and need be checked out. In any type of accident whether it is a car accident, a slip and fall, or injuries resulting from a defective product, a person rarely has the ability to assess their own injuries. 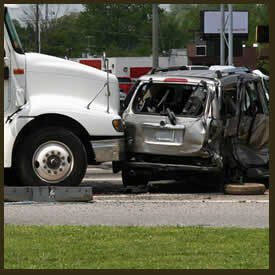 Many times injuries received in an accident do not become apparent for several days or weeks. On behalf of McCULLOUGH, WAREHEIM & LaBUNKER, P.A. we hope this material will be of benefit to you in answering your questions relative to wrongful death. Contact one of our slip fall injury lawyers representing clients in Olathe, Kansas (and throughout the State of Kansas) today to schedule your initial consultation.